If you are super quick and very lucky, you may just get the end of the elderflower season. I was randomly bimbling home along a pedestrian lane last week and spotted a glut of these on the side which I duly and enthusiastically helped myself to. I made sure I picked evenly and left enough on the plant to help it spread next year (the reason was more likely that I am short and I couldn't reach the rest, but hey-ho). As it was now late and you really do need to use the flowers asap, I couldn't acquire some citric acid which you can buy in brewers shops (if they still exist), online or the chemist. Now it is an unfortunate fact that drug users use the stuff and I didn't fancy my chances with the local pharmacy as, quite rightly, who on earth really, really needs citric acid at that time of night? I sure they have had their fair share of junkies pleading that they are making cordial after sun down! Anyway, I decided to power on regardless and make a small amount doubling the amount of lemons as they are, obviously, high in citric acid anyway. I have also bottled and frozen the finished cordial in small plastic bottles (leaving room for expansion!) so that it will be preserved for sure. The recipe I used was based on Sophie Grigson's. If you have the citric acid you can use the full recipe here. Pick off any insects and beasties you see on the flowers. Eeek! Heat the sugar and water in a large saucepan until the sugar has dissolved. 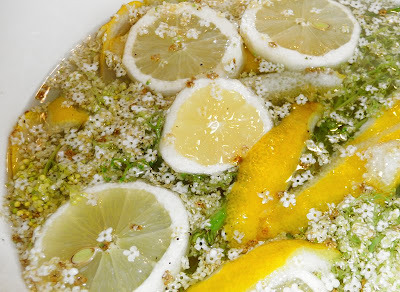 Strip large ribbons of zest off the lemons with a vegetable peeler, lose the knobbly ends, then slice the lemon and place in a large bowl with the elderflower heads. 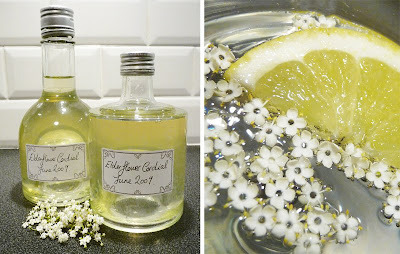 Pour the hot syrup over the lemons and elderflower heads and give it a good stir. Cover the bowl with a cloth or a big plate and leave it for 24 hours. Strain the mixture with muslin or kitchen paper in a sieve and pour into sterilized bottles. I used a couple of small glass ones for the fridge which should be used within a month and a small plastic bottles for the freezer for future use.